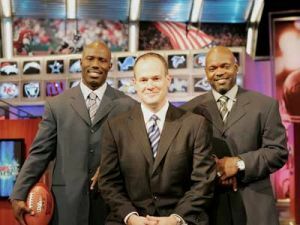 Former Denver Broncos running back Terrell Davis is returning to the NFL—as a media member. Davis has signed a two-year deal with the league's NFL Network as an analyst and reporter, according to the Denver Post's Dusty Saunders. Davis spent time with the network from 2006-2009 and will now be returning to fill a higher profile role. Davis will contribute to "Inside Training Camp Live," "NFL AM," and "NFL Total Access." "I'm working with and watching TV professionals. One of my mentors is Solomon Wilcots (of CBS Sports). I like the way he analyzes teams and reports on what's happening on the field," Davis told the 'Post. On August 2nd, Davis will cover the Broncos' training camp for the network.